Royal Challenges Bangalore (RCB) would first like to reach the play-offs stage of the IPL-T20 on its own strength and strive for the title subsequently, skipper Virat Kohli said on Monday. 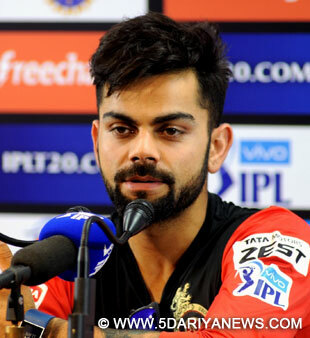 "We would like to be in a position to first reach the play-offs on our effort than depend on how other teams fare, run rate, and who wins or loses," Kohli told reporters ahead of RCB's first league tie against Sunrisers Hyderabad on Tuesday at the Chinnaswamy stadium here.Declining to comment on RCB's prospects of lifting the cup this time with a best combination of players, Kohli said as the tournament was long, it was too early for him to think about the title, given the nature of the format, the intense competition, hectic schedule, travel and rigorous training. "There has been always a feeling that we haven't been able to lift the title having been runners-up twice (2009 and 2011). But as a team, we have done well to be among the top three and in third place (2010)," Kohli said before entering the stadium for a two-hour gruelling practice session under floodlights.Admitting that Aussie speedster Mitchell Starc would be missed due to an ankle injury, the captain said the team got Shane Watson to make up and West Indian leggie Samuel Badree for a strong bowling attack. RCB bought in the February 6 auction Watson, who was part of the suspended Rajasthan Royals team, for a whopping Rs.9.5 crore with other Aussie pacer Kane Richardson for Rs.2 crore and Badree for Rs.50 lakh among the overseas players.Noting that the team had many options to play the best eleven, Kohli said Watson would add strengthen the middle order while Chris Gayle, AB de Villiers and himself would be part of the top order to give momentum to the batting line-up. "We have a strong batting order up to sixth or seventh position. If we play three overseas batters (Gayle, de Villiers and Watson), we have to take the fourth among foreign bowlers. It will be a toss-up between Badree, Kane, David (Wiese) and Adam (Milne) depending up on conditions and against whom we play," Kohli said.Asked if Indian players got over the dramatic loss to West Indies in the semi-final of the recent ICC World T20, Kohli said personally it was difficult for him to get over the loss after creating such a momentum and reaching the semis by beating Australia and Pakistan in the group. "Everyone had taken time off and prepared for the IPL, which is equally challenging with travel, hectic schedules and summer heat. It will also be an opportunity for those who have not been among runs or wickets. And those who did well in the World Cup, Asia Cup and in the ODI and T20 series in Australia, will be motivated to perform better and make their teams win," Kohli added.